The global economy is changing. Rapid resource depletion and demographic reversal together with the lack of scientific advancement and genuine productivity improvement means that there is increasingly a shortfall of capital. Productivity is coming from deploying existing technology with the developing workforce rather than through new industry such as Nano or Bio technology where surely our future must lie. Instead the innovation over the last 20 years has come from the financial sector, enabling this inefficient use of the global balance sheet to go unnoticed, but behind the scenes building an inherent instability and risk. Economic growth has come from factor mobilization rather than innovation, but it is now reaching its limit. Capital has to move ever faster in search of the next marginal resource to keep the illusion alive. The resultant boom and bust in different parts of the world, inflation and deflation in different industries and optimism and despair in populations is causing major social and political strains. Understanding the increased volatility of capital and then managing its effect on different societies is essential to peace. The global economy is changing and the financial industry, which facilitates these capital flows, has to change with it. The stresses are huge and as we saw in 2008, no bank has the scale of capital required to withstand this move. Some even doubt the US economy as a whole has the capital to survive, and certainly not in its present format. Smaller economies are already being marginalized and the US dollar and all forms of paper money are being put to shame by gold, "the barbarous relic of past monetary systems" as the trust in government and fiat money gradually declines. Government does not have the mandate necessary for this kind of economy. The structure of the global economy and world financial industry has to change. Profit rather than productivity is no longer an option; the pendulum has to swing back to the real economy and away from the financial industry. Massive wholesale restructuring is needed. You can either fight it as most of us will try to do, or you can embrace it and hopefully position yourself to benefit from the change. I want to be at the forefront of that change. The scale of capital reallocation will be of unprecedented proportions, changing not only the terms of domestic and international trade but also impacting both absolute and relative asset prices and the risks between different asset classes. A huge amount of money will be made and lost on the back of these capital flows and the political responses to the flows. AML Macro will establish both a framework for a broad understanding of these structural forces and at the same time try to understand how they both are, and will play out in the more immediate time frame. Legacy positions, a lack of understanding for the economic environment in which they operate and the inflexibility from monolithic bureaucratic structures all means that the banking industry will be on the back foot. As 2008 taught us, its cost base is far too high when adjusted for the reality of its loan book in this rapidly changing world. The banking industry will have no choice but to rationalize, cut costs and direct its resources at battling its outstanding loan book for many years to come. It is looking in the rear-view mirror rather than anticipating what is ahead. The very fact that the price of gold is rising and that fiat money is being devalued tells us that the infrastructure to provide capital will also change. Rather than be a necessary casualty I wanted to make the leap and position myself ahead of the pack. To begin with AML Macro will be nothing more than an advisory company, trying to identify changes and trends in the global economy. Under the framework of resource depletion I will be trying to identify and monitor the resultant capital flows and how these affect the finances of different economies and industries. The service will be familiar; my normal daily news roundup, structural theme pieces and intra-day commentary together with the occasional presentation when there is something major to report. There will not however be direct trade recommendations until the business has proved itself and I have sought regulatory approval. Hopefully we can also organize regular round the table discussions to better leverage off each other. A much reduced journey to work should also mean a more amiable person and a better quality product. The purpose however is to build a proper macro research company. This is not a retirement trade but hopefully the start of a company that will develop and become an essential point of reference in macro and economic research in the years ahead. Obviously that will depend on my success in the next few months. The company is funded for the next two years and I will only be taking out a small nominal wage so I will be using any revenues I do get to invest in talent and hopefully build a proper business that can compete with the best in the world. For the next few weeks the service will be free, however from the start of April I will charge USD25,000 a year plus VAT for company subscription. I would prefer to stick with annual subscriptions to ease the admin burden. Whilst this is a lot of money, it is no more than the commission on one decent ticket a year, which is not a lot to pay for information that will hopefully help you pick some of the winning trends and avoid some of the pitfalls. The money can be paid by cheque or commission sharing agreement with your favored bank or broker. I will also see if it is possible to enter a deal with one or two of the broking outfits to see if some other form of commission sharing deal can be arranged. I very much hope we can work together and I can sign you up for an annual subscription. 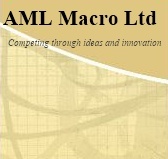 This material has been prepared by AML Macro Limited. The material should not be viewed either as sales material or as research. Opinions expressed herein are subject to change without notification. Any prices or quotations contained herein are indicative screen prices and are for reference only. They do not constitute an offer to buy or sell any securities at any given price. No representation or warranty, either express or implied, is provided in relation to the accuracy, completeness, reliability or appropriateness of the information, methodology and any derived price contained within this material. The securities and related financial instruments described herein may not be eligible for sale in all jurisdictions or to certain categories of investors. AML Macro, its directors, officers and employees or clients may have or have had interests or long or short positions in the securities or related financial instruments referred to herein, and may at any time make purchases and/or sales in them. Neither AML Macro, its directors, employees or agents accept any liability for any loss or damage arising out of the use of all or any part of these materials. The information contained herein does not apply to, and should not be relied upon by, private customers. All rights reserved. This material is strictly for specified recipients only and may not be reproduced, distributed or forwarded in any manner without the permission of AML Macro Limited.